With 39 pcs white and 24 pcs red SMD LEDs, the brightness is up to 700 lumens, provides sufficient illumination to brighten up the work area all around. 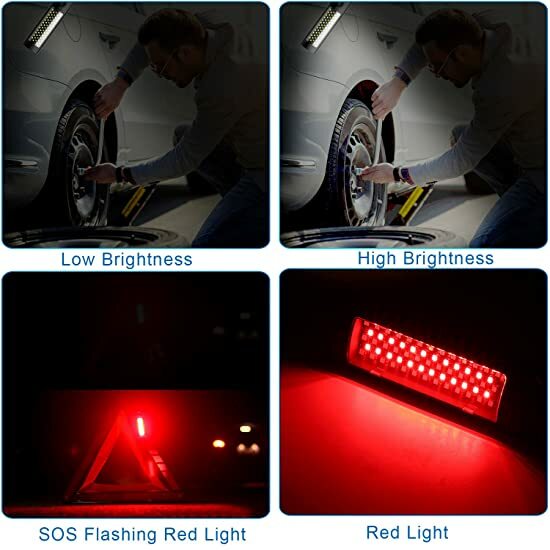 High Brightness White, Low Brightness White, Steady Red Light, SOS Flashing Red Light. The strong magnet base on the back attaches easily to any metallic surfaces steadily and allows hands free to do more things. Rotatable hook and carry-on strap is perfect for hanging in anywhere you need. About 4 hours with AC charger(included), indicator light turns from red to green. Built-in 5000mAh Li-ion rechargeable battery saves batteries and protect environment. About 3.5 hours for high brightness mode(700lm), 7 hours for low brightness mode(350lm), and 6 hours for flashing mode. 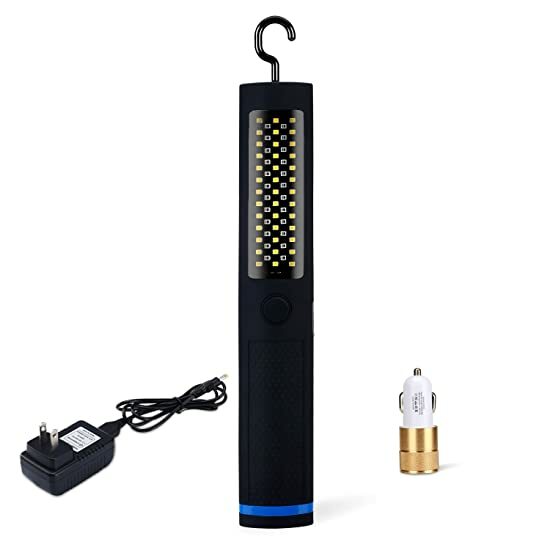 Portable and lightweight makes it perfect for both indoor or outdoor rainy days such as automotive repair, emergency, workshop, garage, basements, container and camping or fishing use. 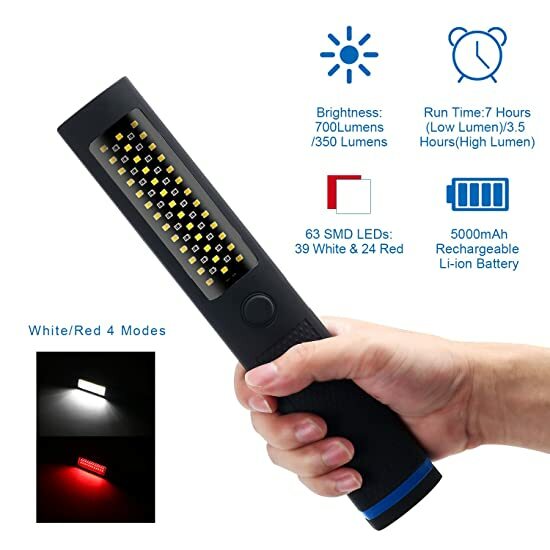 ⭐700 LUMENS SUPER BRIGHT: With 39 pcs white and 24 pcs red SMD LEDs, the brightness is up to 700 lumens, provides sufficient illumination to brighten up the work area all around. ⭐7 HOURS RUN TIME: Built-in 5000mAh Li-ion rechargeable battery to ensure 7 hours running time with 4 hours fully charge in 350 lumens mode. 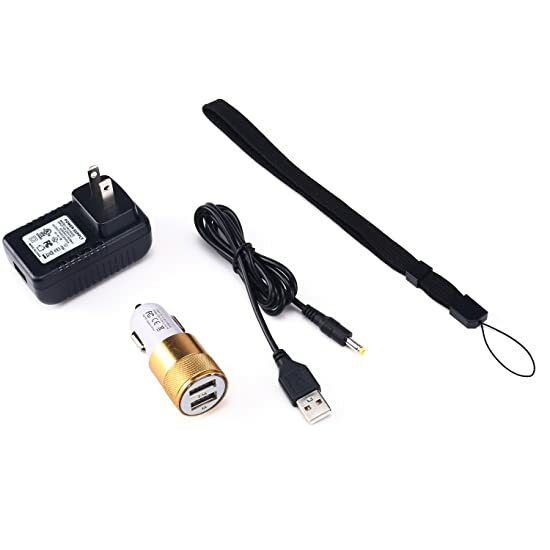 So you can take it to anywhere anytime you need a portable light without worrying about power running out. 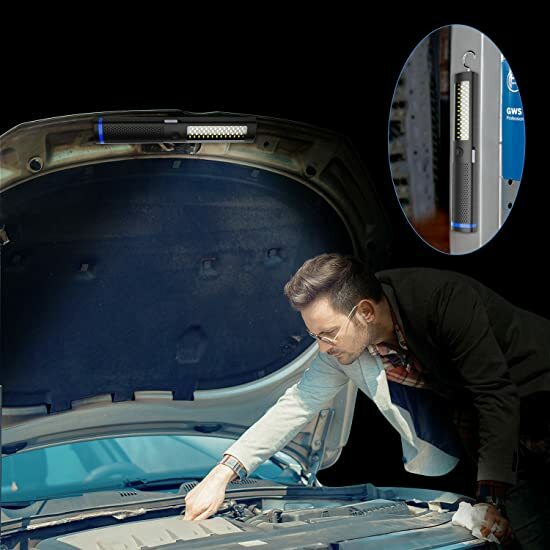 The overcharge and over discharge protection could maintain the light's longevity. 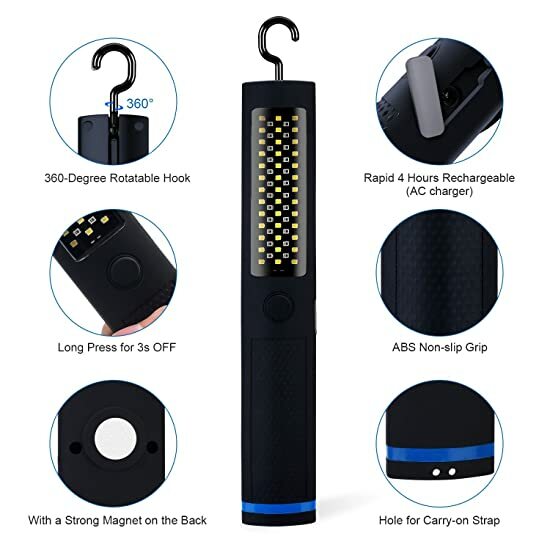 ⭐MAGNETIC BASE&360-DEGREE ROTATABLE HOOK: With strong magnet on the back, you can stick it to any metallic surface for hands free use. 360-Degree rotatable hook and carry-on strap also makes it portable and convenient for different use. 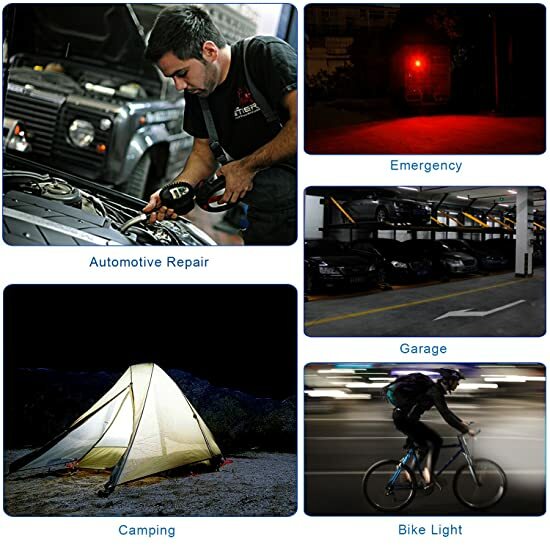 ⭐4 LIGHTING MODES: High brightness white(700lm), low brightness white(350lm), steady red light, SOS flashing red light. 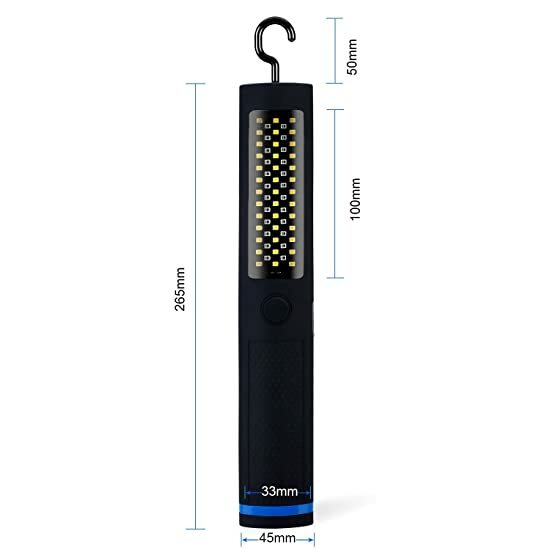 The work light is IP55 water-resistant, making it perfectly suitable for both indoor or outdoor rainy days such as emergency car repairs, garage, basements, container and camping or fishing use. 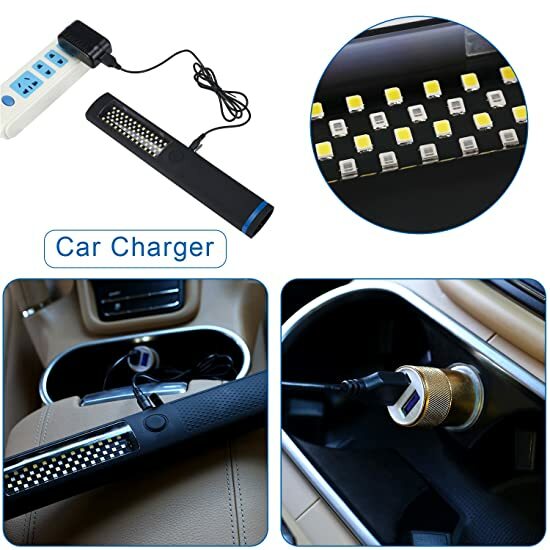 ⭐WHAT YOU GET: Rechargeable work light, AC charger, car charger, carry-on strap, circular steel plate, 1 year warranty and excellent customer service.